After putting up a 5-foot-tall Christmas tree in my apartments the past few years, I decided to switch things up for the holiday season. As much as I enjoy the pretty glow of a Christmas tree, turns out that I don't enjoy the process off putting a tree up and decorating. The branches that shed their needles! The garland that sprinkles its little glittery pieces all over! The lights that I always manage to get tangled up in! I always end up more frustrated than anything. And since the taking-down part is just as loathsome (if not more!) than putting-up – I'm embarrassed to say that I've let a Christmas tree stay up well into February or March. Horrible, I know! So this year, I kept things small and simple in my apartment. My mom had a spare tree – a cute, short, sparkly silver, pre-lit tree that is just perfectly sized for my white and chrome dining room table. Since it's pre-lit (aaahh, I love that term!) and super sparkly without garland, all I had to do was add some colorful ornaments. I'm still on the hunt for a teeny-tiny tree skirt, but for now my glittery turquoise deer is right at home under the tree. This is definitely the smallest, simplest, and cheapest Christmas tree I've ever put up in my place, but it's also my favorite for those very reasons. And no less festive! Also, as you can see we have snow here. I'm not a fan of running around in it (brrrr!) 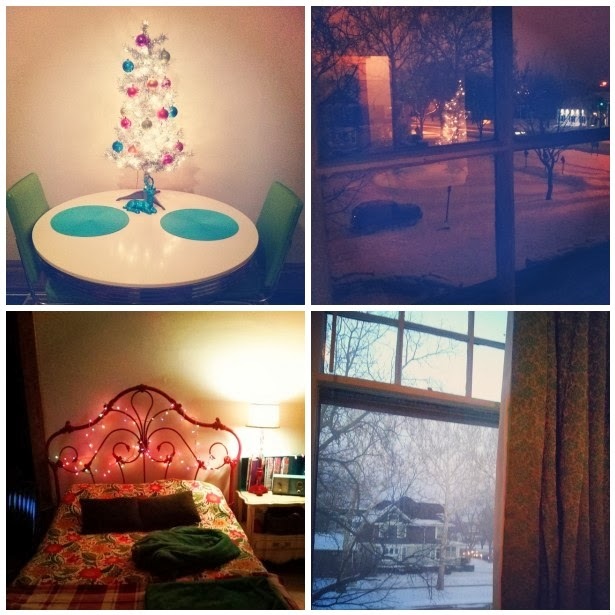 but I can't help but admit how beautiful it is to admire out the window of my cozy apartment. What decorating have you done in your dorm or apartment? Email photos to jessica@thelovelyside.com to see your holiday decor featured on the blog! Photos above are from Instagram. Follow me here.